Now I would like you to meet Blueberry, she is a sweet teddy bear that my hubby bought me for Easter one year she is so soft and cuddly. She loves to get into my tatting and play dress - up. 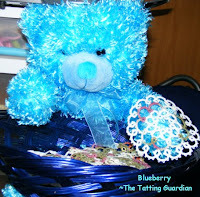 So I decided to make her guard bear of my tatting she sits by me on my little table here and keeps my tatting safe. She looks loveable but touch the tatting and she will take your arm off. wow. That's totally what I was doing last night...was just on my way to blog about it....WEIRD! i have done the same thing with my patterns. 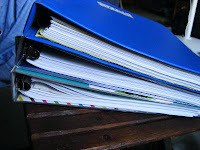 but i need to get more binders because i have tatting, crochet and knitting in one and it's a bit disorderly. But I bought a huge pack of sheet protectors and have been using those. Congrats Heather you won this week's big prize in my Mondo giveaway...go check my blog!